I have found dahlias to be about as addictive as wasabi peas and chocolate covered almonds. A dahlia will stop you in your tracks. This beauty was discovered in a community garden on the streets of New Your City. Oh, I’ve always found them enchanting, to be sure, and have certainly swooned while visiting the dahlia test garden at the Minnesota Landscape Arboretum — that little caged jewel box of delights. But, this is my first year of growing the lovelies and I will never turn back. Nothing gives you a ta-da effect in your garden like the dahlia, especially at this time of year when our garden enthusiasm wilts in the late summer heat. I profiled a great dahlia grower, Sue Keator, a few years ago in my Northern Gardener Obsessions column. Check out the article. 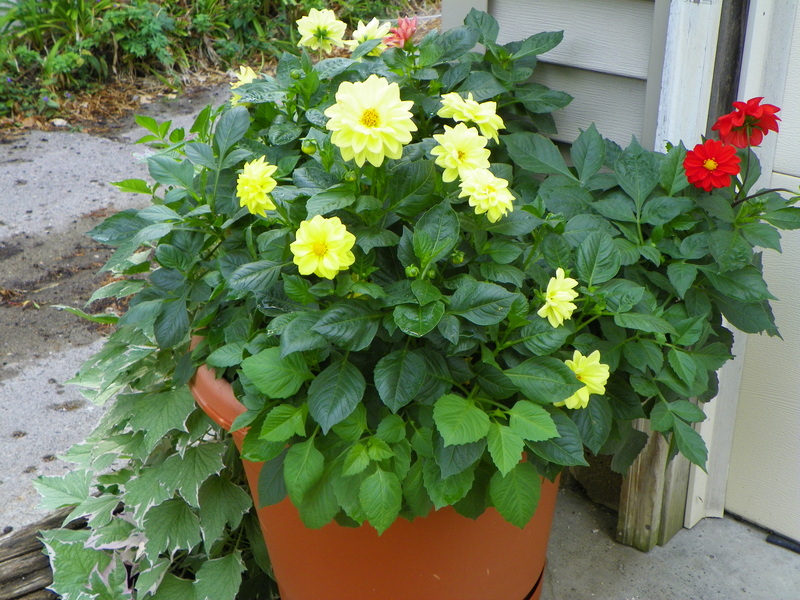 Perky little dahlias can add pop, snap and zing to a container. Full sun. They are sun worshippers and need at least six hours of full on baking in it. They have hearty appetites and scream for fertilizer. Begin with a rich soil, ammended with compost. Then plant the tubers with a slow-release granular fertilizer and even water from time to time with a water-soluble fertilizer. This is what gives you the real beauties. Oh, yes, the Japanese beetle likes the dahlia, so you will need to knock them of in a disciplined manner. But, the bees love them, too! Pinching back the plants, much like pinching back mums, forms branches and more branches means more blooms. Sue Keator recommends this after three to four sets of leaves are formed. The bunnies may help you with this! Dahlias need a good support group. Sue Keator uses inverted tomato cages. I staked mine, which has worked well. 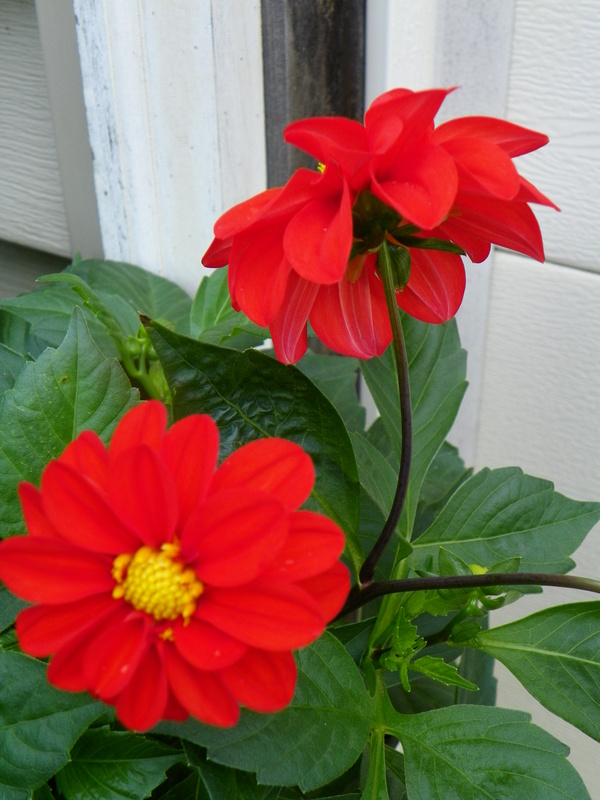 A pot of dahlias can jazz up even the garage door entrance. When starting out, consider starter plants rather than tubers. They’re so easy. These are actually not in full sun and though they do not flower pell-mell, they do quite well. Dahlias as starter plants are all over in the garden centers in the spring ad this is great way to go. ‘Elga’ in my front border. Kids love dahlias. Planting tubers really opens you up to diverse visual world this flower brings. Generally, the tubers are planted three-inches deep. It can be a little tricky to decide which end goes up, but look for the growing tip. And don’t fret if your tubers look a little shriveled, like old potatoes. They will likely rebound into lush plants. 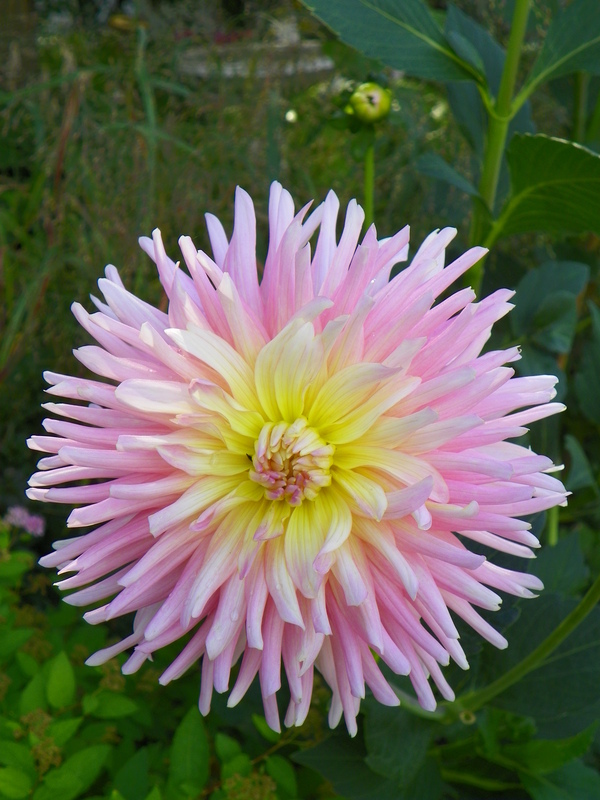 The Minnesota Dahlia Society has a great website, chock full of info. It’s an education in itself. Bookmark it and check out their tuber sale in May of every year. 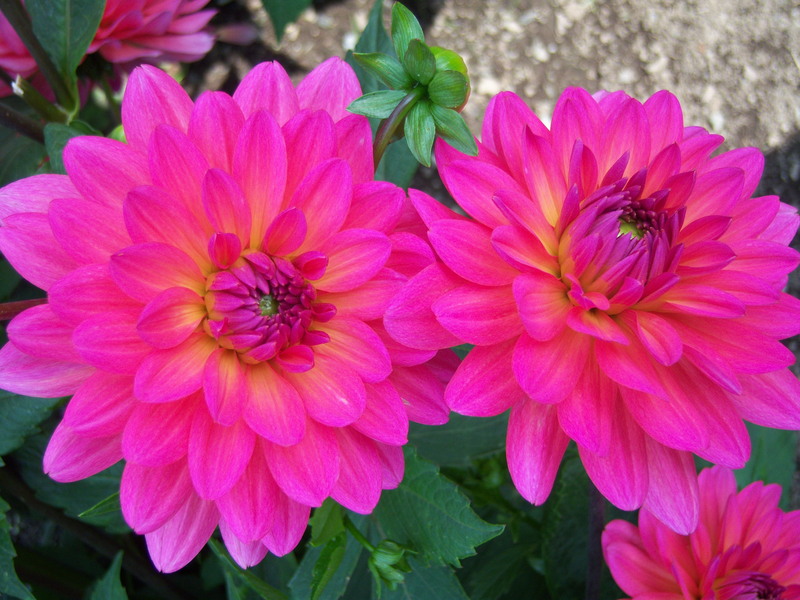 You will get rock star dahlias and a ton of great advice from friendly, fellow gardeners who have fallen deeply in love with the intoxicating dahlia.